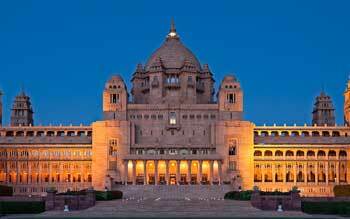 The Umaid Bhawan Palace in Jodhpur is one among the world’s largest private residential building. The palace is owned by Maharaja Gaj Singh and is partly managed by the Taj Hotels. One part of the palace is a museum. The palace was completed in the year 1943 by Maharaja Umaid Singh. This palace was built to provide work to people during a famine in the land. After the rule of the Rathore Dynasty, a saint cursed that the land shall be enveloped in drought for a particular period of time. As per the curse there was drought for 3 consecutive years and the people sought the help of King Umaid Singh who was the then ruler of Marwar. The king in order to provide employment to the people started building a lavish palace. Thus started the construction of the Umaid Bhawan Palace. Presently the palace is of three parts one which is occupied by the royal family, another by the Taj Hotels and the other part is by the Museum in the Palace which showcases the ancestral belongings of the royal family. Umed Garden, Kotsa Travellers gallery and Mehrangarh Fort. October to March is a perfect time to visit the Palace. By air : The nearest airport if the Jodhpur airport which is a domestic one and can be reached from other cities in India easily. By train : The Jodhpur railway station is at a distance of 4 kilometers from the Palace. By road : Jodhpur is easily connected by road to all other major cities and bus and taxi services can be hired easily.